So every year I love that 1 day! World book day!!! As a T.A I love to encourage and inspire children always. 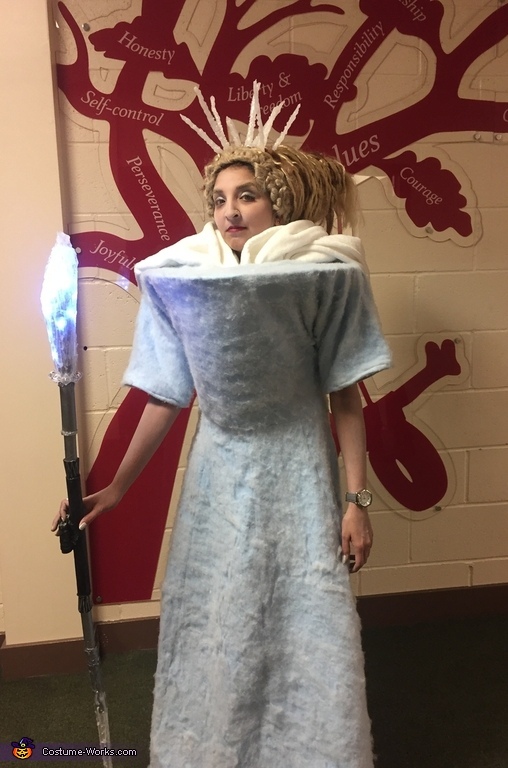 This year for world book day I decided on Jadis the White Witch from Narnia.Not an easy look but nothings impossible!!! So I get planning probably a year before as I want my costumes to look perfect and amazing!!! The wig was very difficult at first but all just fell into place. Now some of the materials I use you would not imagine!! I have always said to the children to try and keep the costs low when making a diy costume! Creative juices should flow and anything can be tried and tested!! Base to the hair is a tissue box cover made from felt and cardboard to make the cone hair shape. Once everything is glue gunned into place I covered it all with wadding. Then to add the blonde straight hair wig and the brown wig twisting it all around and sewing it into place by needle an thread! Icicles are made from hot glue. The dress is made from felt material. Next carefully using fabric glue, glue a THIN layer of wadding all over the dress. When dry sew the front to the back and its done!! Finally getting that round collar shape??? I got a flat plastic hoop attached it to a round piece of thick card and pushed it through the wide neckline so it sits on your shoulders. The magic freezing wand was empty rolls glued together. But the best bit a button to light up the end giving it that magical freezing look! fairy lights fed through the tubes/rolls. Blonde eyebrows and eyelashes easy... use make up! Worked perfectly! Kids loved it at school and so did the adults. The best bit was when the children ask about how everything was made, it gets them very excited to try out different and new things. We had snow too so that was perfect my powers worked... great day enjoyed by all!! !